My next door neighbours son lately visted me in my Violin- Making- Workshop. The boy is ten years old and got very interested in what I'm doing in my workshop. When I showed him raw wood materials and tools for violinmaking, explaining what I'm currently working on he listened carefully and asked me about different things that hung on the wall or stood around in the workshop: What is this; what is that? Sometimes he promised that he had never seen something before. When his eyes picked up my violin bridge blanks, which are hanging on a string in the window I followed and asked him to examine it closer. I told him that is called: "Steg", (german for bridge) and what function it has on the violin. 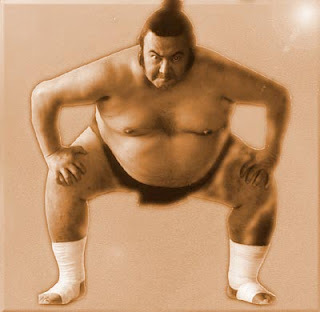 Then he replied: "It looks like a sumo wrestler" while he simulates the typical acting of a sumo wrestler by bending his arms and feet in the way sumos do! This comparison wasn't new to me, but I really wondered that this young boy was able to reflect the truth that lies in this parable. A sumo? I prefer having a bridge looking at me while I play my violin! : ) Great imagination for a 10 yo!